Please email or call Treetec for a quote on Elm Leaf Beetle treatment. Treetec provides a range of services including soil treatment and stem / trunk injection. These treatments generally last three years and we offer a two year guarantee. Where possible Treetec recommends the use of non chemical treatments and cultural methods for the management of plant pests and diseases. Where chemicals are used this should be a part of an Integrated Management System. The person from Treetec who treats your tree will be a fully qualified arborist with chemical application certification. The most appropriate Elm Beetle control depends on the season, degree of insect infestation, tree size, tree location / siting and philosophy. Elm Leaf Beetle infestation can defoliate a tree, if this happens continually the tree may die. Other factors such as drought, poor pruning / lopping or soil compaction will contribute to a decline in tree health. 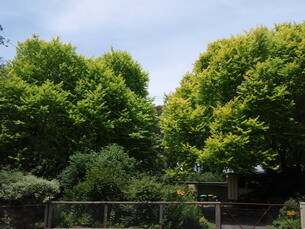 However one or two years of Elm Beetle damage or ongoing moderate damage is very unlikely to kill the host tree, unless there are other significant contributing factors. Currently the most effective control measures for Elm Beetle involve chemical application. Generally trunk / stem injection or soil injection, both methods have advantages and disadvantages - there is more detail below. It is possible also to do canopy spraying however this is only suitable for some trees at certain times of the year and is more expensive in the long term. Note. Nearly all chemicals currently used commercially in Australia to treat Elm Leaf Beetle, regardless of brand name or delivery method, are neonicotinoid insecticides. this is the chemical type that was banned for all but a few specific uses by the European Union in 2013 and may soon be permanantly banned across Europe. The ban is due to the association between the widespread use of these chemicals and the direct impact on bee populations and other polinators. To manage Elm Beetle infestation it helps to understand a little about the Elm Leaf Beetle life cycle. The Elm Beetles spend the cooler months in sheltered places such as wood piles, house eaves, cars & under bark. 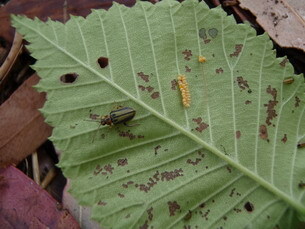 As trees come into leaf the Elm beetle emerges and flies onto the new growth where they begin to feed; they damage the leaves by eating small holes that look as though someone let off a shotgun through the canopy. 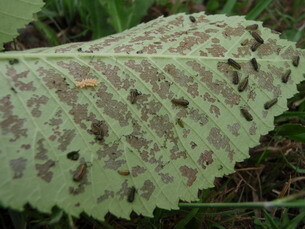 * Many of the Elm Beetle larvae will take the easy option and fall off the tree rather than use the trunk. Unfortunately eradication of the pest is unlikely in the short term so the best approach is to look at long term management of your tree using an Integrated Pest Management (IPM) system. This involves planning, monitoring, taking action and evaluating the outcome. Generally it comes down to looking after your trees health as best you can, accepting that there will be some damage, minimising beetle numbers where you can and a stem injection application each 3 years (guaranteed success for 2), we give you a reminder call and arrange the treatment, if you leave it much longer than this, Elm leaf beetle population numbers can explode. This said if, in the third year, your Elm tree looks healthy and relatively uneaten then there should be no problem with delaying treatment for a 4th year - reducing chemical use and costs. If you do leave it only to find your tree getting badly eaten in spring it is not too late for an arborist to make a visit and treat the tree. You should monitor the tree for beetle and larvae numbers. An insecticide is injected into the ground around the tree in multiple holes, the tree takes up the chemical through the roots and delivers it to the leaves where the Elm beetles and larvae ingest it. One treatment usually lasts for 3 years. Treetec offer a 2 year guarantee. An insecticide is injected (via multiple small drill holes) directly into the trunk of the tree, the tree transports the chemical to the leaves where it kills the beetle and larvae. Further information on tree biology and drilling into tree trunks. 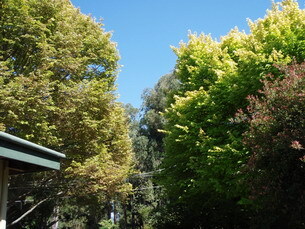 An insecticide is sprayed onto the foliage, spray units can reach high into canopies and long hoses enable access to most trees. This application method results in significant over-spray, lasts for months only and we recommend against it. Stops the Elm Beetle life cycle as many of the larvae descend the trunk to pupate, there are a number of options both chemical and other. Use of natural predators of Elm Leaf Beetle; research by the applicable government agency into these options is ongoing, to date it has not been successful.